Eggshells Kitchen Co., a cook’s dream stocked with culinary tools and cooking gadgets, is also the home to a series of local chef-lead cooking classes. This past Monday Capi Peck of Trio’s, an institution in Little Rock’s family-owned restaurants, discussed Arkansas strawberries. 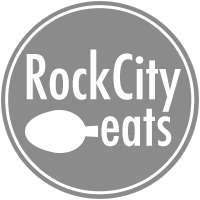 As the class began, 30 or so guests were happily seated at tables facing a TV-like cooking set-up at which Peck was at the helm, with the help of Trio’s co-owner Brent Peterson. Twenty pounds of fresh, local, ruby red strawberries were center stage. Although the classes are not set up for much hands-on cooking action from the guests, Peck quickly enlisted volunteers to help prep strawberries for the recipes she shared: Strawberry Gazpacho, Strawberry Basil Sandwiches, and the famous Strawberry Shortcake served at Trio’s. She came prepared with suggestions on how to adapt the tartness, such as by adding sugar. She also suggested mixing two parts balsamic vinegar with one part honey, and simmering the mixture on the stove before simply drizzling it over the berries. (Delicious right? Trust me, we tried it and it was.) Sometimes embracing the tartness works out for a slightly tangy and even spicier dish, like the vegetable based Strawberry Gazpacho she shared. Strawberries are the only fruit with the seeds on the outside. During the days of Marie Antoinette, strawberries were believed to have been an aphrodisiac. There is more vitamin C in a strawberry than an orange. As Peck whipped up the dishes, she gave sage advice such as, “Remember that recipes are really just sort of a guide, use your imagination.” She also is a firm believer that “The better your ingredients are, the better your end product will be.” She suggested never skimping on olive oils and vinegars, as well as, of course, fresh local, produce. She also firmly believes in prepping berries only right before use as cleaning them before storage will devalue their shelf-life. One by one, the dishes were passed around to the guests to enjoy. All three creations would go over extremely well for a hot, summer patio party. Peck expects the Arkansas strawberry season to end around the second week of June, so you might want to try these out sooner rather than later. 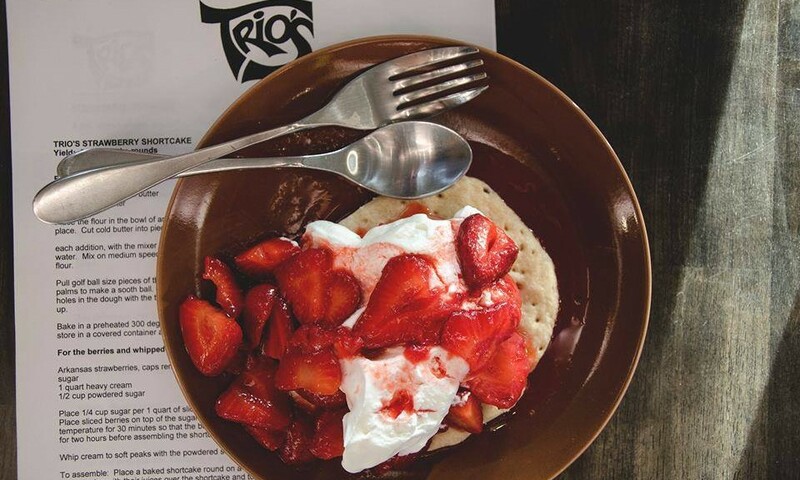 For your taste bud pleasure, Peck has shared Trio’s famous Strawberry Shortcake recipe with us to share with you. Don’t miss any upcoming classes at Eggshells, they are a great way to have fun and learn some valuable food and cooking knowledge. Place the flour in the bowl of an electric mixer with the paddle attachment in place. Cut cold butter into pieces and add several at a time, mixing well after each addition, with the mixer running. Alternate butter with the ice cold water. Mix on medium speed until butter is completely incorporated into the flour. Pull golf ball size pieces of the dough from the mass and roll between your palms to make a smooth ball. Flatten each ball onto a sheet pan and make tiny holes in the dough with the tines of a fork to prevent the pastry from puffing up. Bake in a preheated 300 degree oven for 20 minutes. Let cool completely and store in a covered container at room temperature for up to three days. Place ¼ cup sugar per 1 quart of sliced strawberries in a large mixing bowl. Place sliced berries on top of the sugar and stir gently. Let stand at room temperature for 30 minutes so that berries can release their juices. Chill for two hours before assembling the shortcakes. Whip cream to soft peaks with the powdered sugar. To assemble: Place a baked shortcake round on a serving plate. Ladle strawberries with their juices over the shortcake and top with whipped cream.